Tomorrow is a special day for me! Most of you know that my husband and I are Pastors. I work in the area of Pastoral Care at our Church. In 14 years on staff we’ve done tons of weddings together, but on Saturday I will be performing my first wedding on my own! I’ve come to know this lovely couple over the past few years and am blessed they asked me to do their wedding. It will be outdoors, which is also a first for me. I’m a bundle of nerves, and also quite delighted as well. What a joy to watch two people covenant before God for a lifetime together. One of the things I sometimes like to do when we officiate weddings for people, is to create a gift for them based on the Scripture they chose. So, this will be for them! 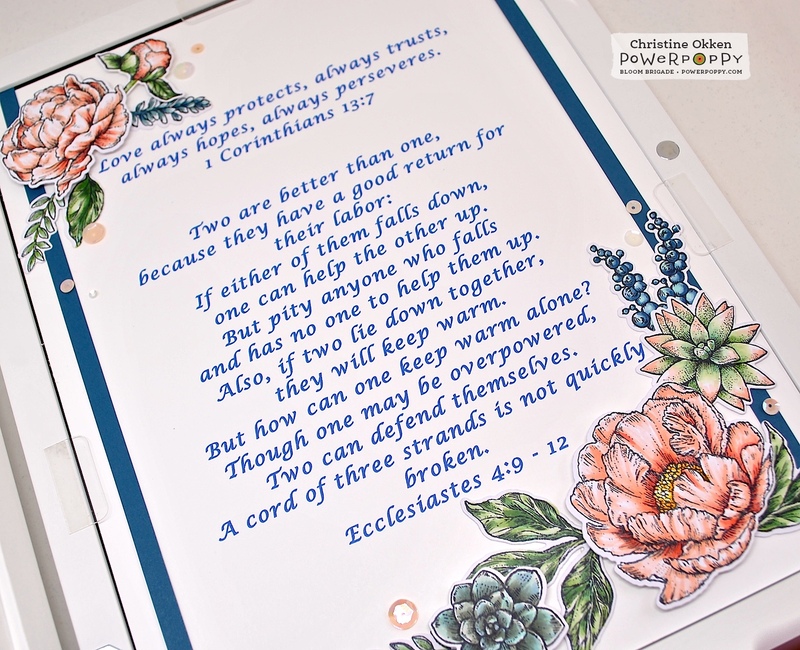 They chose 1 Corinthians 13:7 and Ecclesiastes 4:9 - 12. Their wedding will be peach and navy with peonies and succulents as the flowers, which worked so perfectly with two of Power Poppy’s gorgeous sets! This was a bear to photograph because it’s just larger than 9 x 12. So there are quite a few photos ahead. 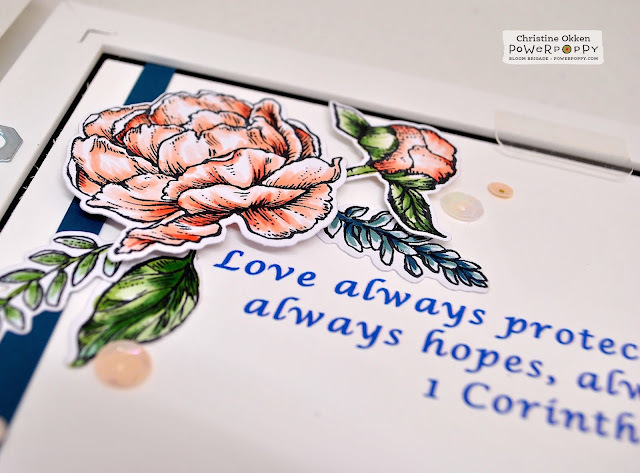 I started with Power Poppy’s new dies for Peony Muse, and Succulent Singles and die cut out a lot of the different shapes of peonies, leaves, and succulents. Then I stamped them all up with the stamps from Peony Muse and Succulent Singles. They are coloured up with Copics, tying the colours together. 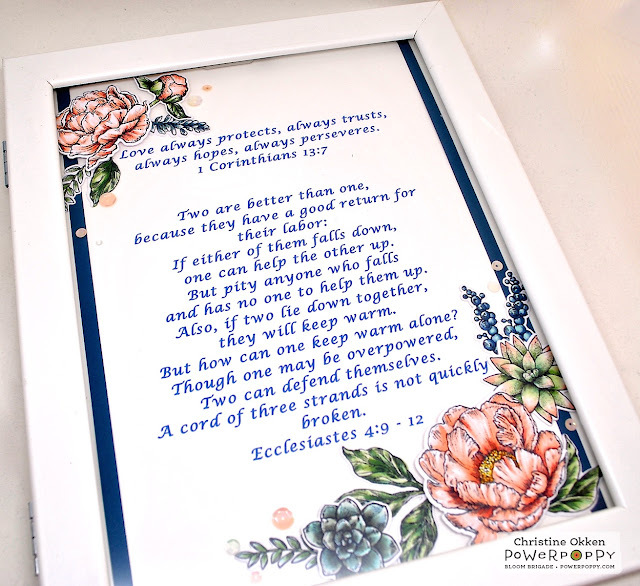 I printed the verses in some scripty text that was pretty and then added the flowers and succulents bit by bit until it framed the verses in a pretty way. 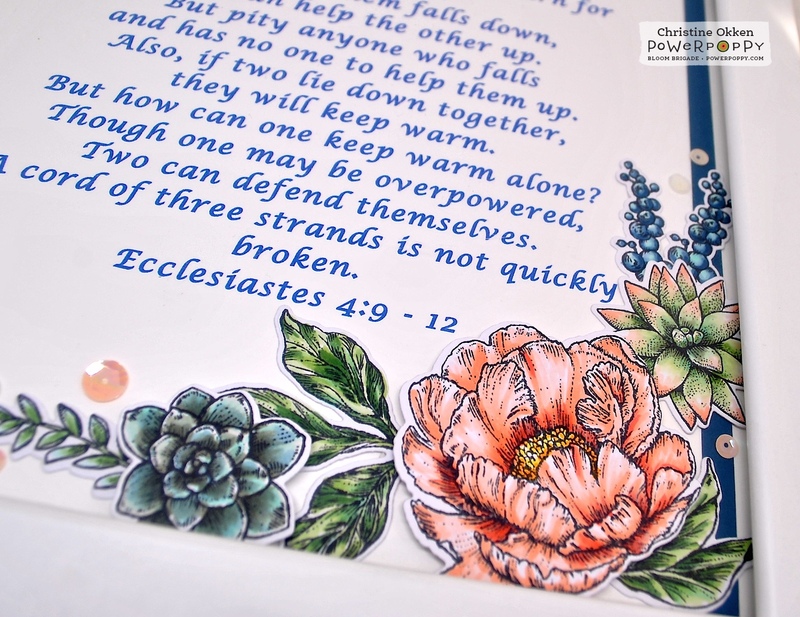 I kept the accents to a few simple peach sequins so that verses would take center stage. Some of the elements are popped up a little and then other pieces are tucked behind. The above is with the frame open to get a bit of a clearer look at the flowers not under the glass. 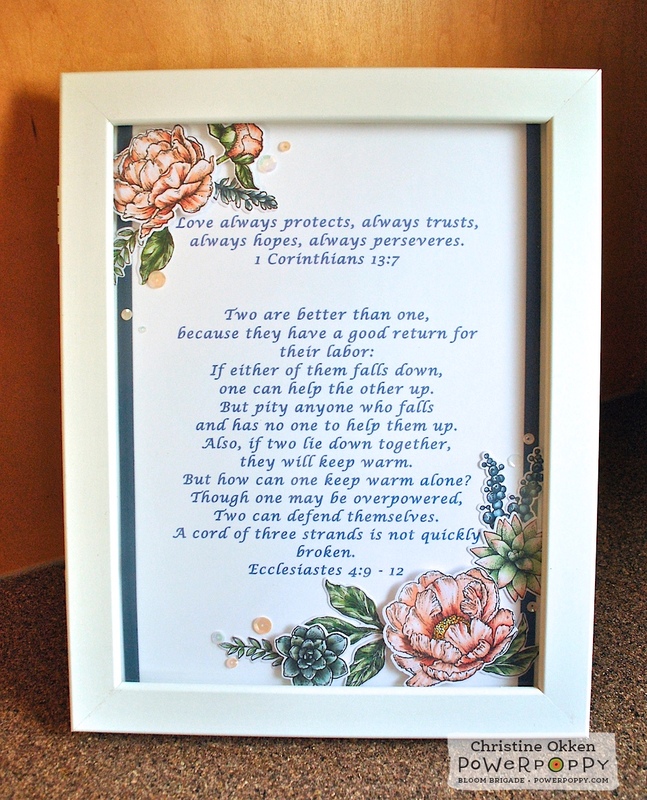 I love that it’s such a personalized, meaningful, yet simple gift for them. 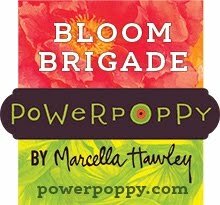 And....as you can see I’ve combined two different Power Poppy sets together, which is perfect for Power Poppy’s newest Power & Spark Challenge to Mix and Match! Next week I’ll show you the card I made for the design, and a special something the bride asked me to make for her groom. Who would have thought you could put peonies and succulents together? But I really think it works. 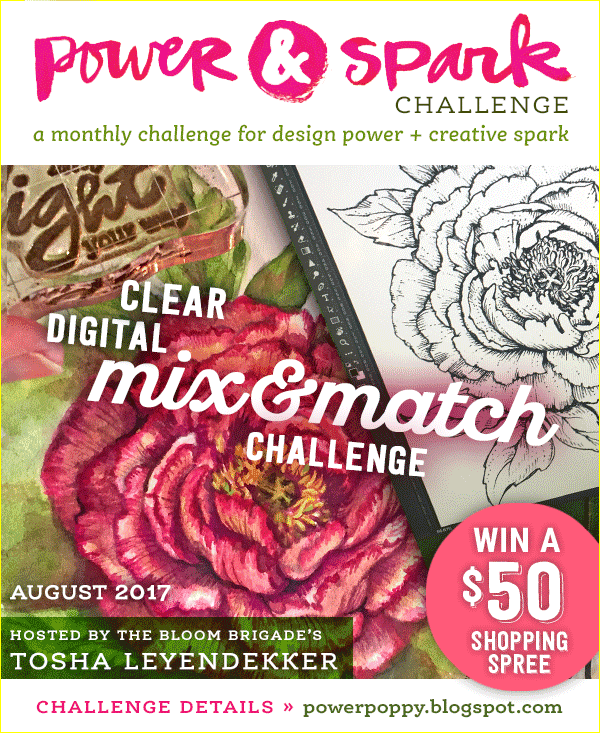 So this challenge is your opportunity to put different images together and find great new ways to show off your creativity. We hope you can join us, it could mean a $50 shopping spree in the Power Poppy Store! and Julie giving us the Good Vibe Friday at the Power Poppy Blog! P. S. Thanks for all the wonderful photos, because they really do help to see the amazing details you've included! Hugs! Gorgeous--and I'm sure this will be a family heirloom. What a lovely gift!! Wow, absolutely gorgeous! What a great way to use the images. 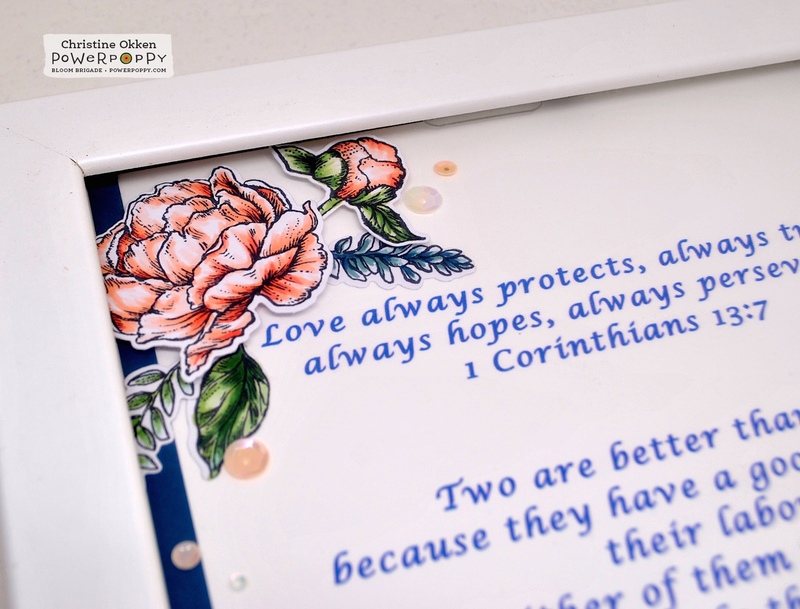 I am sure your going to do a wonderful job tomorrow at the wedding :) But I understand the nerves.... this is an absolutely wonderful gift for the couple, such a wonderful reminder of their wedding day!